NEW YORK, New York, October 29, 2012 (ENS) – After claiming 69 lives in the Caribbean countries it ravaged last week, Hurricane Sandy struck land near Atlantic City, New Jersey about 8 pm Monday night. Four hours later, 11 more people have lost their lives to the howling winds and flooding rains of the enormous storm. Stretching nearly 1,000 miles along the Atlantic coast, the winds from Hurricane Sandy blew down power lines and trees, leaving hundreds of thousands of people without power. Crews cannot get to the stricken lines in the dark along flooded streets and roadways. The big cities of the Northeast, Washington, Baltimore, Philadelphia, New York and Boston, all endured torrential rainfall and winds gusting to more than 85 mph. 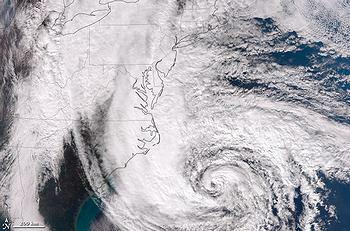 As Sandy turned northwestward over land, it met a cold-weather system from the north that turned it into an unprecedented superstorm, dumping up to three feet of snow in West Virginia and the central Appalachians. Now classified as a post-tropical cyclone, Sandy is still packing hurricane-force winds, although it is weakening slightly as it moves north across New England. Packing 80 mph winds, the storm hit Battery Park at the tip of Manhattan with a record 13-foot surge of seawater due in part to the full moon high tide. Subway tunnels and stations are flooded, the Metro Transit Authority says, and Con Edison will be struggling for days to repair damages to the power system that have darkened much of Lower Manhattan, including Wall Street. On the east side of Manhattan Monday night, 19 workers were trapped inside a Consolidated Edison power station by rising floodwaters, according to a Reuters news witness. A rescue worker, who asked not to be named, said the station had suffered an explosion inside. 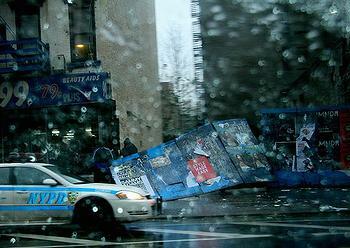 The company says some 250,000 customers in Manhattan and Westchester County are without power. Thousands of company employees and field crews are working around the clock to restore power joined by 500 outside utility contractors who are here to assist with storm restoration. 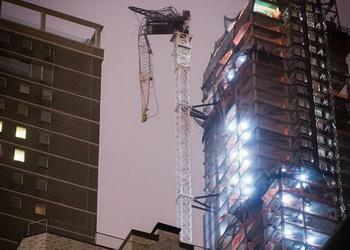 On 57th Street at Sixth Avenue, an unsecured crane atop a tall building was blown off its moorings at the One57 Building, a luxury 90-story apartment tower under construction. It remains there, dangling 74 floors above the street. The city of New York is at a standstill with all public transportation systems shut down until further notice and authorities asking that people not drive to leave the roads clear for emergency vehicles. All three major airports in the New York-New Jersey area are closed due to the storm as are airports in Atlantic City and New Haven, Connecticut – nearly 12,000 flights have been canceled. Philadelphia’s public transportation system was shut down just after midnight Monday and will not be moving passengers on Tuesday, officials said. In Massachusetts damaging winds are forecast to persist on Tuesday with associated widespread power outages. The south-facing coastline is experiencing major coastal flooding overnight. Boston’s transport system has been shut down but some lines will be open on Tuesday as MBTA crews work to clear downed trees, power lines, and storm-related debris. President Barack Obama and Republican challenger, former Massachusetts Governor Mitt Romney, canceled all campaign appearances, with just a week to do before Election Day. The President has authorized emergency declarations for Connecticut, Delaware, the District of Columbia, Maryland, Massachusetts, New Jersey, New York, Pennsylvania and Rhode Island. The declarations authorize FEMA to coordinate all disaster relief efforts for required emergency measures to save lives and to protect property and public health and safety. The President is directing FEMA Administrator Craig Fugate to ensure that federal partners continue to bring all available resources to bear to support state, tribal, and local responders. Currently, more than 1,500 FEMA personnel are positioned along the East Coast working to support disaster preparedness and response operations, including search and rescue, situational awareness, communications and logistical support. In addition, 28 teams comprised of 294 FEMA Corps members are pre-staged to support Sandy responders. Three federal urban search and rescue task forces are positioned in the Mid-Atlantic and ready to deploy as needed. To the south across the Caribbean, people are cleaning up and mourning their dead. The worst of Sandy’s damage happened in Haiti, where 52 people are dead as a result of heavy flooding and strong winds that blew from Wednesday through Friday. Most of the deaths occurred in southern Haiti and in Port-au-Prince, where many residents still live in makeshift shelters after the 2010 earthquake. On the other side of the island in the Dominican Republic, two men drowned while trying to cross rivers in separate incidents, while rains and wind damaged nearly 3,500 homes and more than 18,000 people were evacuated by the government, the AP reported. On Thursday, Sandy struck Cuba as a Category 2 hurricane, killing 11 people in the provinces of Santiago and Guantanamo. In the Bahamas on Friday, two people were killed, including a British banker who fell from his roof as he tried to repair a window shutter. In Puerto Rico, one man was drowned in a flooded river, and more than 100 families were forced to evacuate.